Growing environmental concerns have led to a drastic change in consumer and manufacturer preferences. On similar grounds, biosurfactants market is witnessing a major turnaround with shifting inclination from synthetic products to bio-based products. Rising concerns regarding synthetically derived surfactants and favorable norms set by renowned bodies such as REACH and EPA to promote eco-friendly products are set to significantly push the overall biosurfactants industry growth. Demand for naturally derived and sustainable products especially in Latin America and Asia Pacific have significantly impelled the growth of this industry. Sulfate free, sugar-based products, and neem extracts are the major bio-based products with biodegradable, low- toxicity and cost-effective properties. Driven by the escalating demand in detergents & personal care sectors owing to the product’s high sustainability and longer shelf life, biosurfactants industry from these applications is projected to record substantial growth in the coming years. Biosurfactants market from household detergents collected revenue worth USD 785 million in 2015 and is likely to witness considerable demand in future. Other application segments of biosurfactants industry include industrial cleaners, agricultural chemicals, textiles, food processing, oilfield chemicals, and personal care. These biosurfactants are derived from vegetable oils and fatty alcohols. In the food processing applications, biosurfactants are used as foams, emulsifiers, gels, and stabilizers. Biosurfactants market from food processing segment is anticipated to grow a rate of 4.5% over the period of 2016-2023. Industrial cleaner biosurfactants are widely used for oil surface cleaning and paint stripping and are estimated to register 4% CAGR from 2016-2023. Based on the types of products, biosurfactants industry comprise rhamnolipids, methyl ethyl sulfonates (MES), sorbitan esters, sucrose esters, and alkyl polyglucosides (APG). The methyl ethyl sulfonates are biodegradable and are therefore primarily used in laundry detergent. Its high tolerance toward calcium ions also makes it preferable for laundry soaps. 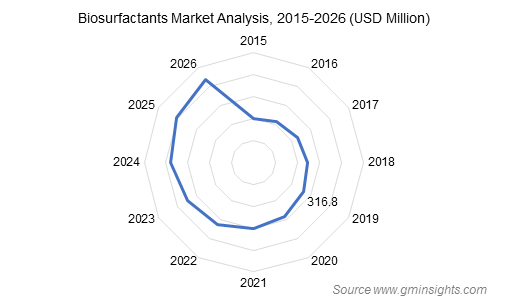 MES biosurfactants market collected a revenue of USD 580 million in 2015. Rhamnolipids is another prominent product in this industry, projected to witness highest CAGR of 7.5% over the period of 2016-2023. These are widely used in formulation of moisturizers and shampoos. Sophorolipids and monoglyceride have a strong application scope in personal care products as they possess intrinsic properties and biocompatibility with human skin. The Alkyl polyglucosides biosurfactants finds application in aluminum brighteners and metal cleaner detergents. Growing household based detergent demand is likely to boost APG biosurfactants market, which is set to record 4% annual growth rate over 2016-2023. As per a report by Global Market Insights, Inc., the global biosurfactants market is expected to exceed 520 kilo tons in terms of volume and generate revenue over USD 2.6 billion by 2023. Consumer preference for bio-based ingredients in the U.S. have significantly influenced the regional biosurfactants industry. Growing regional demand coupled with increase in spending capacity is set to lead the U.S. biosurfactants market size to surpass 120 kilo tons by 2023. Furthermore, strong demand from personal care, textiles, chemicals and agricultural industries in the emerging economies of India and China has opened up huge growth prospects for the business expansion. China biosurfactants market is foreseen to grow at an annual rate of 4.5% over the period of 2016-2023. Increasing investments in the research activities to develop 100% bio-based products along with robust technological developments will create huge opportunities for the market participants. The major challenge for these market players will be achieving cost effectiveness over the synthetic & petrochemical counterparts. Ecover, Saraya, BASF-Cognis, Urumqui, and MG Intobio Co. Ltd. are the key biosurfactants market players holding more than 65% of the overall business space. Other notable industry players include Mitsubishi Chemical, Lion Corporation, Croda International, Chemtura Corporation, Sun Products, and AkzoNobel. This entry was posted in BIOMASS, BIOENERGY AND RENEWABLE CHEMISTRY and tagged Alkyl Polyglucosides, APG, Biosurfactants Market, Biosurfactants Market Size, Biosurfactants Market Value, Global Biosurfactants Market. Sophorolipids, MES, Methyl Ester Sulfonates, Methyl Ethyl Sulfonates, Rhamnolipids, Sorbitan Esters, Sucrose Esters. Europe biopolymer coatings industry will generate a significant revenue with a CAGR of more than 6% over the coming seven years. Surging usage of the product in the food & beverage sector owing to the deployment of supportive rules and regulations will drive the regional growth. 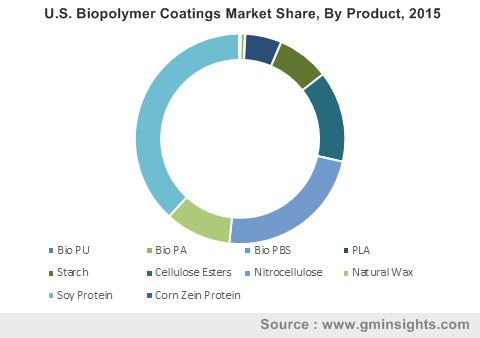 Germany, UK, and France are forecast to be the major contributors of Europe biopolymer coatings market. PLA based biopolymers are extensively used in the food & beverage sector for vegetables, water, fruits, nuts, beverages, and alcohol packaging, pertaining to which PLA based biopolymer coatings market will collect a revenue of more than USD 50 million by 2024. Considering that the globe has been facing the environmental issues of landfill and degradation, consumers have been changing their focus from plastic to paper, mainly across the APAC belt. Asia Pacific accounted for more than 45% of the share in global paper production industry. The increasing usage of paper across the food & beverage sector will positively impact the packaging sector, which in turn will favor biopolymer coatings industry share. Bio PU based coatings are easily available, less harmful to the environment, biodegradable, and less expensive, subject to which bio PU based biopolymer coatings industry will register an annual growth rate of more than 6% over the period of 2016 to 2024. The growth can also be attributed to the escalating use of the product for automotive, furniture, textile, and architectural applications. 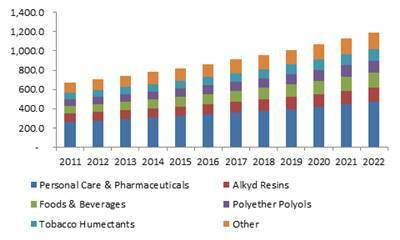 China biopolymer coatings market will exhibit an annual growth rate of more than 6.5% over the years ahead. Governmental initiations toward the usage of renewable packaging will favor industry growth. Additionally, growing industrialization across this region coupled with surging construction activities will fuel the requirement of the product for furniture, flooring, and decking, thereby propelling the regional biopolymer coatings market. Germany natural wax based biopolymer coatings market will exhibit a CAGR of 3% over the coming timeframe, owing to the presence of a huge automotive manufacturing base. This product is primarily used to manufacture steering wheels, door seats, dashboards, and consoles, which leads to its extensive deployment across the automotive sector. Bio polyamide coatings is extensively used across wire goods, construction, electrical, and automotive sector pertaining to the notable benefits of the product such as high chemical resistance, protection against fire, and electrical resistance, which will favorably influence biopolymer coatings market size. Soy protein based product segment will grow at an annual growth rate of 4% over the years ahead. A global need for reduced raw material price trends has been identified, which is likely to generate attractive growth opportunities for the market players. In addition, prominent companies have been focusing on product differentiation and capacity expansion to expand their footprints across the globe. Extensive funding on research and development activities is also a key strategy adopted by these players. Major participants in biopolymer coatings market are AkzoNobel, Cargill, BASF, Roquette Group, EcoSynthetix, Corbion, and Novamont. This entry was posted in BIOMASS, BIOENERGY AND RENEWABLE CHEMISTRY and tagged Bio PA Coatings, Bio PBS Coatings, Bio PU coatings, Biopolymer Coatings Market, Biopolymer Coatings Market Size, Cellulose Esters, Corn Zein Protein, Global Biopolymer Coatings Market, Nitrocellulose Coatings, PLA Coatings, Soy Protein Coatings, Starch Coatings, Wax Coatings. Mandatory roll outs by governments of various developed economies have played the most influential role in escalating biobased polypropylene market demand over the recent years. Two global regulatory bodies whose initiations regarding the curtailment of carbon footprints have enhanced the market outlook are EPA and EU, which undoubtedly translates a noticeable expansion and development of North America and Europe’s biobased PP industry. Europe market dominated by Germany, UK, and France is projected to show a steep growth curve, at an annual rate of 6% in the next five years. In addition to this, increasing consumer demand for lightweight vehicles that allows lower fuel consumption is further fueling the market growth. Light weighted materials are also being widely deployed in medical space, pressure vehicles, wind vehicles and other alternative energy bases. A report by Global Market Insights, Inc., states that Biobased Polypropylene Market will surpass a revenue of USD 40 million by 2022, with a CAGR estimation of 4.5% over the period of 2016-2022. Textile is another niche application segment of global biobased polypropylene industry. Geotextiles which are gaining a global popularity owing to its rising scope of application in soil erosion and drainage activities is primarily favoring the overall market growth. 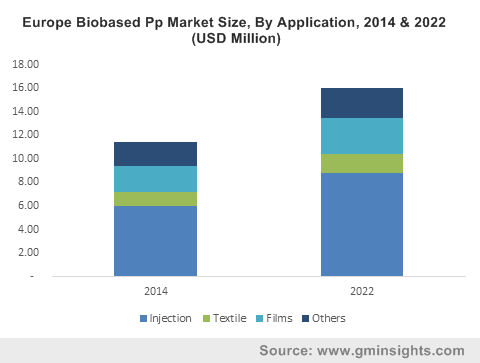 Biobased PP market demand from textile applications is foreseen to rise high in the coming five years, with an estimated volume coverage of 1.5 kilotons by 2022. Biobased polypropylene films are being extensively implemented in green packaging especially for food and beverage and medical purposes owing to its strengthening properties and transparency. Biobased PP industry from this application is projected to show an upswing in its growth chart with a CAGR projection of 4.5% over the period of 2016-2022. This entry was posted in BIOMASS, BIOENERGY AND RENEWABLE CHEMISTRY and tagged Bio Based Polypropylene Market, Bio Polypropylene Market, Bio PP Market Size, Biobased Polypropylene Market, Films, Injection, Synthetic and Bio-Based Polypropylene Market, Textile. Bio-based material comprises a vast spectrum of raw material such as pectin, starch, cellulose, protein, and chitosan, that are extensively used for biopolymer film production. The ample availability of these materials will lead bio-based biopolymer films market to record an annual growth rate of 6% over the coming seven years. Bio-based materials are extensively used for food packaging industry, which led the end-user segment to account for more than 35% of the total revenue contribution in 2015. The food packaging sector is predicted to earn significant revenue over the coming timeframe. The factors positively affecting biopolymer films industry growth are growing awareness among the consumers regarding the usage of biodegradable products along with the implementation of strict regulations by FDA and EPA. Agriculture end-user segment will exceed a CAGR of 5% over the years ahead, primarily driven by the surging product demand for greenhouse components, mulching, and irrigation purposes. In addition, biopolymer-based products are being used to reduce environmental hazards by replacing synthetic glass and plastics. This, in turn, will augment biopolymer films market size considerably. Medical & pharmaceutical and home & personal care are the other notable end-user segments, which will also garner significant revenue. Taking into account the product trends, biopolymer films market is mainly divided into cellophane, polyamide, PHB, mulch, PVA, PLA, and PHA. PHB biopolymer films market is anticipated to register an annual growth rate of 5% over the period of 2016 to 2024. In addition to possessing the property of biodegradability, these products also offer the benefits of conventional petrochemical films. PLA biopolymer films market occupied about 25% of the overall share in 2015 and is predicted to collect noticeable revenue over the years ahead, primarily driven by the product’s usage across the food packaging and agriculture sectors. Based on the various technologies, atomic layer deposition will record a CAGR of 5.5% over the coming years of 2016 to 2024, owing to the extensive use of this technology in PHB and PLA films, pertaining to its capability to act as a water vapor barrier. Multilayer and sol-gel are the are other lucrative technology segments of biopolymer films industry. Considering the regional landscape, Asia Pacific biopolymer films market will register maximum growth rate over the period of 2016 to 2024. The growth can be attributed to the growing product requirement for medical and food packaging applications. Shifting consumer trends along with growing expenditure on cosmetics and food items will also augment the regional industry growth. The contribution of the U.S. toward the regional industry has indeed been noticeable, owing to which North America biopolymer films market share was USD 800 million in 2015. This region is expected to record a flourishing growth rate over the years ahead. The attributing factor toward biopolymer films industry growth across this geography is the surging demand for the product across the packaging sector. In addition, strict implementation of rules and regulations regarding food packaging by the FDA will favor the high product demand across the U.S.
Braskem, BASF, Avery Dennison, Plastic Union, Evonik Industries, Toray Industries, Mondi Group, Amcor, Innovia Films, Taghleef Industries Inc., Amcor, Industria Termoplastica Pavese, NatureWorks, Klöckner Pentaplast, BioBag International are the noteworthy participants in biopolymer films market. 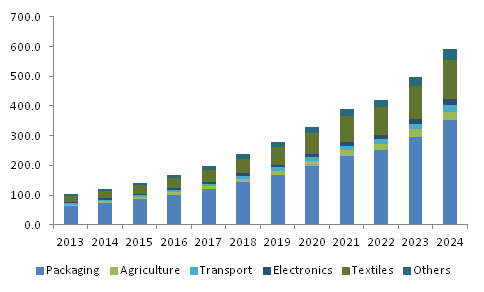 This entry was posted in BIOMASS, BIOENERGY AND RENEWABLE CHEMISTRY and tagged Biopolymer, Biopolymer Films, Biopolymer Films Market, Biopolymer Films Market Analysis, Biopolymer Films Market forecast, Biopolymer Films Market Outlook, Biopolymer Films Market PDF, Biopolymer Films Market Price, Biopolymer Films Market report, Biopolymer Films Market Share, Biopolymer Films Market Size, Biopolymer Films Market Trends, polymer. Taking into account the lactic acid application trends, lactic acid market size in the personal care sector is expected to grow at a significant rate over the timeframe, driven by its use in skin care, natural anti-aging, and anti-acne solutions. Its application in food & beverages sector will grow at a rate of 14% over the coming seven years. The growth can be credited to its emulsifying, antibacterial, acidulant, pH regulating, and flavoring characteristics. As per the research study, PLA applications in the packaging sector, estimated at USD 300 million in 2015, are expected to grow noticeably over the coming seven years due to its use in jars, containers, bioplastic packaging, and food packaging. Furthermore, textile is yet another prominent application area, predicted to generate high growth opportunities for polylactic acid industry over the coming years. As per the research study, textile application is likely to grow at a rate of 19% over the timeframe, driven by the use of PLA in textile dyeing for biodegradable polymer production. Geographically, Germany lactic acid industry is expected to generate high sales over the next few years, driven by the rise in number of manufacturing plants coupled with increasing emphasis on sustainability. Growing application of lactic acid to treat dry skin along with its use in metal formulations is expected to boost U.S. lactic acid industry growth in the pharmaceutical sector over the coming years. China personal care industry is expected to contribute significantly towards the market share over the coming timeframe. Lactic acid application as vital ingredient in the personal care products & antimicrobial cleaning along with growing consumer awareness towards the personal care item is expected to drive the regional growth. France PLA market will experience a considerable surge over the period of 2016-2024, driven by favorable legislations coupled with penetration of bio-based products in the packaging sector. Increase in production capacity, abundant feedstock, and growing customer awareness is expected to drive Japan market revenue over the next few years. UK PLA market size in agriculture sector is expected to register significant gains at 15% over the coming seven years, owing to its ability to reduce soil compaction and improve moisture control. This entry was posted in BIOMASS, BIOENERGY AND RENEWABLE CHEMISTRY and tagged Anti Corrosion Coating Market, Applications, Competitive Analysis And Report, Forecast, Growth Trends, Lactic Acid & Polylactic Acid (PLA) Market - Global Lactic Acid & Poly Lactic Acid (PLA) Industry Size, Lactic Acid Market, Polylactic Acid Market, Potential, Price, Share, Technology. Dodecanedioic Acid finds its application in adhesives, powder coatings, resins, and lubricants. DDDA market price in resin sector worth USD 235 million in 2015, is expected to grow substantially over the coming seven years. The growth can be attributed to the increasing use of nylon in screws, gears, and fabrics. 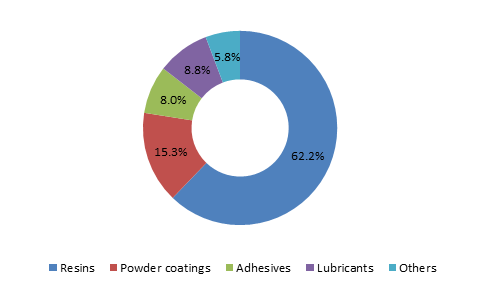 DDDA market size in powder coatings industry is expected to grow at a rate of 6% over 2016-2023 owing to its wide applications in powder coatings & paints production. Innovations in coating technology for industrial paints is predicted to promote DDDA market growth over the coming years. Paints & Coatings production capacity estimated at 1700 kilotons in 2015, is expected to surpass 3170 kilo tons by 2023. Rising demand for DDDA from industrial coatings sector along with growing preference for providing protective industrial paints are few of the factors predicted to contribute significantly towards the growth of the DDDA application in paints & coatings industry over the coming years. Asia Pacific DDDA market revenue worth USD 125 million in 2015, is expected to witness a substantial growth over 2016-2023 owing to rapid industrialization along with rising demand for paints & coatings. China, Japan, and India are anticipated to be the major revenue pockets for the region over the coming years. North America DDDA market is expected to register a CAGR of 5.5% over the coming seven years due to booming nylon production along with presence of automobile giants such as General Motors & Ford who have adopted eco-friendly technology to reduce greenhouse effects. U.S. is expected to contribute significantly towards the regional share over the coming years. Latin America DDDA market is expected to witness highest gains of 5.8% over the period of 2016-2023, owing to high demand for lubricants. Brazil is projected to make a major contribution towards the overall revenue of the region. Middle East & Africa Market is projected to record a CAGR of 4.8% over 2016-2023 due to the expanding paints & coatings industry as well as growth of oil & gas sector. This entry was posted in BIOMASS, BIOENERGY AND RENEWABLE CHEMISTRY and tagged Competitive Market Share & Forecast, Dodecanedioic Acid (DDDA) Market Size By Application, Downstream Application Potential, Industry Analysis Report, Price Trends, Regional Outlook. Biodiesel and Oleochemical manufacturing has expanded the Glycerol market which is forecast to cross a revenue of USD 3.04 billion by 2022, as per the study by Global Market Insights, Inc. In 2015, Biodiesel accounted for approximately 68% of the total glycerol production. Biodiesel is said to be the most significant production source for glycerol and is anticipated to produce 2700 kilo tons of glycerol by 2022. Besides, the other prominent source, the oleochemicals are anticipated to exceed 20 million tons by 2022. Global Glycerol market is estimated to grow at a CAGR of 6.6% over the period of 2015-2022, mainly driven by its applications across various industries such as Personal Care & Pharmaceuticals, Alkyd Resins, Food & Beverages, etc. 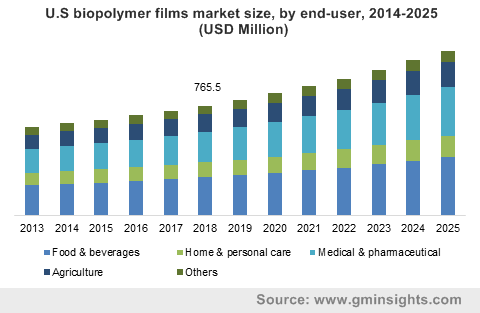 Glycerol applications in personal care & pharmaceuticals accounted for 38% of the total market share in 2015 and is anticipated to register a CAGR of 6.5% over 2015-2022. The growth will mainly be driven by healing and nutritional properties offered by glycerol along with the improved lifestyle and health awareness of the consumers. Glycerol applications in Alkyd resin will also witness significant surge over the coming timeframe due to its wide set of applications in synthetic paints industry such as enamels, varnishes, protective coatings, etc. The glycerol market in alkyd resin application segment is likely to exceed USD 400 million by 2022. Food and beverage industry will also witness huge adoption of glycerol in the coming years owing to its use in food preservatives, solvents, sweeteners, and humectants. Glycerol applications in this sector is anticipated to exceed a volume of 500 kilotons by 2022, registering a CAGR of 7% from 2015-2022. The application has also seen significant growth after declaration of glycerol as food additive by European Union Food Standard Agency. The Asia Pacific is expected to dominate the global glycerol market with revenue estimations of USD 1.4 billion by 2022. Increase in construction spending, growing alkyd resin demand, and presence of large oleochemical base are key factors to drive the regional growth. The glycerol production in APAC through fatty alcohol production source is estimated to grow at a CAGR of 8% over 2015-2022. The U.S glycerol market size is projected to exceed 700 kilotons by 2022. The growth is mainly driven by huge demand from the personal care & pharmaceutical industries which accounted for 38% of the overall market share. Europe glycerol market is anticipated to surpass 1190 kilotons by 2022, with biodiesel being the prominent production source. The market is consolidated and integrated owing to the high priced raw materials. Key market participants include Wilmar International, Emery Oleochemicals, KL Kepong, Dow Chemical, Solvay SA, P&G, BASF, Croda International, Godrej Industries, Evonik, Archer Daniel Midland, Vitusa Products, Inc, United Coconut Chemicals, and Ecogreen Oleochemicals. This entry was posted in BIOMASS, BIOENERGY AND RENEWABLE CHEMISTRY and tagged Competitive Market Share & Forecast, Downstream Potential, Glycerol Market Size By Application, Industry Analysis Report, Price Trend, Regional Outlook.